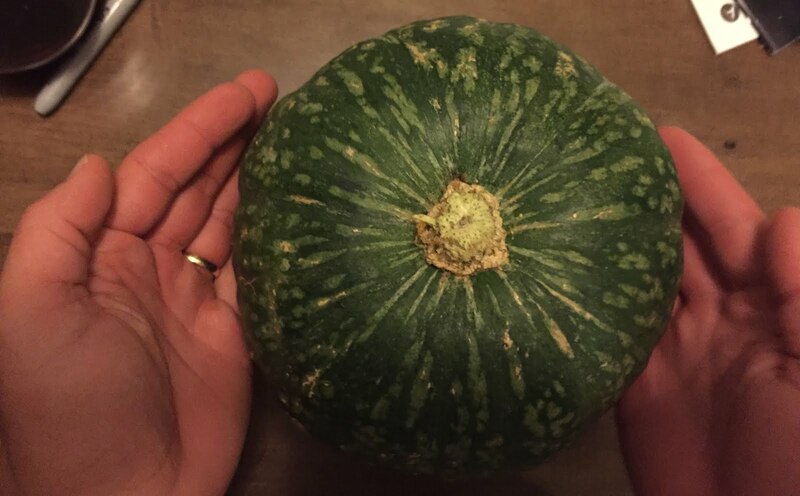 Kaboocha Squash is my favorite squash. My mom and lola put it a lot of meals. I wanted to hate it. It was like a yellow potato but didn't taste like potato. It was sweet and easy to eat. It was really good. When I left for college and then out to Portland I never really ate it again. I even cheated on kobocha squash. I ate a lot of acorn and even dabbled in butternut squash. But after all is said and eaten, Kabocha squash is my favorite. This soup is perfect for the beginning of fall. It's rich and warm but still light hearted. I like texture, so I made a side of purple cabbage slaw with lime, and green onion. I placed it on top of the soup. It was a good call and it made it ready for Instagram. 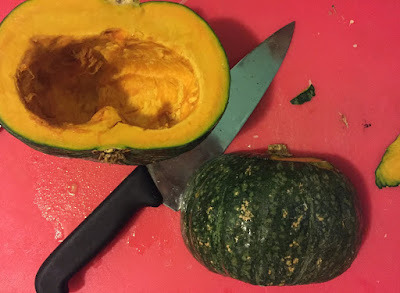 Roast 1 kabocha squash. Scoop out the seeds, cut into quarters. Massage it with olive oil and salt to taste, and roast at 350 for 45 minutes. Sautee 1/2 onion, 2 cloves of garlic in 2 tablespoons of olive oil or coconut oil. Then add a 1 inch nub of grated ginger, 1/2 inch of grated tumeric, half of a lime zest and 1/2 tablespoon of curry. I also added red chili flake and a nub of jalapeno. Because I like to live on the wild side. Saute until fragrant. About 4 minutes. Scoop roasted squash from skin and add to the onions. Mix around. Add 1 can of coconut milk and a half of can of water or half a can of vegetable broth plus 2 cups of broth to the pot and bring to a boil. *if using water, make sure you have a vegan bouillon cube and add two cups of water and bring it up to a boil to dissolve the cube. Once it has been brought to a boil, turn it off and with a hand blender, blend out all the chunks. Return to a medium heat. Adjust the seasonings and add a squeeze of half a lime. I like mine on the limey side and I also added a tiny bit of soy sauce, about 1/2 -3/4 teaspoon.